When I was a kid we’d watch this quiz show – Call my Bluff. The idea being two teams of three would each be given an obscure long-forgotten word with three possible definitions, only one of which was the true, the other two were false. After each team member read out their definition (often in an entertaining, convincing fashion), a member of the opposing team would try to guess the correct one. The obscurity of the words, some scientific, others just downright weird and out-dated, and the convoluted delivery of the definitions took the simple concept and made it watchable. Why else would anyone be interested in forgotten words? Later, came the board game Balderdash. The principle of the game was similar, except each player has the chance to make up definitions for each word on the playing card. Then, everyone tries to guess which is the correct answer (the person with the correct answer mixes the definitions up and reads them out randomly). Personally, I found it more fun coming up with the false definitions than guessing the correct one. It led to inventiveness around the origins of words and hilarity after a few rounds of alcohol. The point of the game – none whatsoever, however, it did inspire a great deal of silliness. Writing nonsense is my post for today. How much time do we spend rationalising our thoughts, determining what we write is correct, believable, accurate or plain common-sense. When stuck for ideas, why not let fly all reason and pluck out something with no reasoning – a nonsense poem, a ridiculous series of events or an incredible set of co-incidences, or go fantastical with a wondrous world where the laws of physics doesn’t matter. Why not write some balderdash and de-stress. My book for today – a wonderful children’s tale with a giant size fruit, a flock of birds and talking insects – now who would have thought of that? 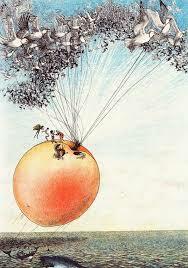 Roald Dahl – James and the Giant Peach. I used to watch Call My Bluff – Frank Muir(?) and the lovely guy who was always giggling. Panel games have moved on since then, but are not necessary better. (‘Cept QI). Enjoying your posts. Frank Muir, Sandi Toksvig. I remember them. I don’t watch game show these days, with the exception of the odd QI, which is rather like an updated version of Call My Bluff with more wit and faster pace, but intelligence in there. Trying to remember the giggling man’s name, I’ve just been on Google and it was Arthur Marshall, who, I’ve just read, was a member of British Intelligence during the war. Something of a hero while he was at it. Now there’s a piece of completely irrelevant and useless trivia for you. Thanks for transporting me back to when panel shows really were fun! A delightful journey. Thanks so much for your kind words on my blog yesterday. I miss those panel shows, too. I LOVE that game. I won once by writing something about a clip on tie. It was awesome. I love word games,not cryptic ones, but the kind which stimulate the imagination. Ah, we happen to be reading James and the Giant Peach in one of my classrooms this week. You know, when I first started writing short stories I would come up with ideas and then toss them with a “that’s too ridiculous”. Then I started reading police logs from various newspapers and watching shows like “My Strange Addiction” and realized that very few ideas are too outrageous to use. Real life gets pretty weird. Life is weird and outrageous – which is wonderful news for a writer! Thanks for the comment. Great idea to write some balderdash! Something crazy or silly or unexpected can open all kinds of creative thoughts. I think I’ll try that. Thanks! I find writing silly limericks gets the creative juices flowing – helps unblock those moments when the brain freezes. My oldest son liked the Dahl books, and I vividly remember reading them out loud to him. I enjoyed them as much (or more) than he did. They were such a treat.